One year in the early 2000s, back home in Oregon from college in Pittsburgh, I turned on the tv and was treated to an episode of Oregon Field Guide. As I remember it, it was a special episode where the places they were going to show were so amazing and undiscovered, that they were going to keep their locations secret. I was treated to amazing footage of Roaring Spring, somewhere in the McKenzie River watershed, where an enormous waterfall spews forth from a hillside, with no aboveground river feeding it. Since it is fed by snowmelt percolating into the porous lava aquifer, its flow is relatively constant year round and by itself provides 1% of the summertime flow of the Willamette River. I vowed to myself that I’d someday go there, and the mystery over its location only increased my curiosity. Well, over time, I eventually googled and found some research papers and articles about these falls (maybe people weren’t as quick to google back then?). These papers had photos of the falls and a hydrogeological map of the springs. I overlaid the map onto Google Earth and voila, I had my coordinates. Fast forwards around 10 years. I planned a trip to finally go to Roaring Spring for August 3 with my friend Kyle from way back in middle school. It was a reasonable drive from Salem, with only a mile or two of gravel road. We pulled off the road and scrambled down into a dry creekbed. After descending the creekbed, we traversed and bushwhacked through thick rhododendron bushes until we heard a faint roaring noise, which got louder and louder until we got to the edge of a ridge, and we saw…and we saw below us a stream. A stream, Roaring River, with no apparent spring. The hillside where we were standing was bone dry, a stark contrast to the lush mossy green that the video and articles depicted. The stream below was difficult to get to, and no waterfall appeared to flow into it. We fought the plants a little bit further to the exact coordinates where I expected the springs to be and there was nothing. Dejected, we bushwacked 15 minutes back up to the road. I noticed from the topo that continuing on the gravel road crosses all of the stream’s tributaries. 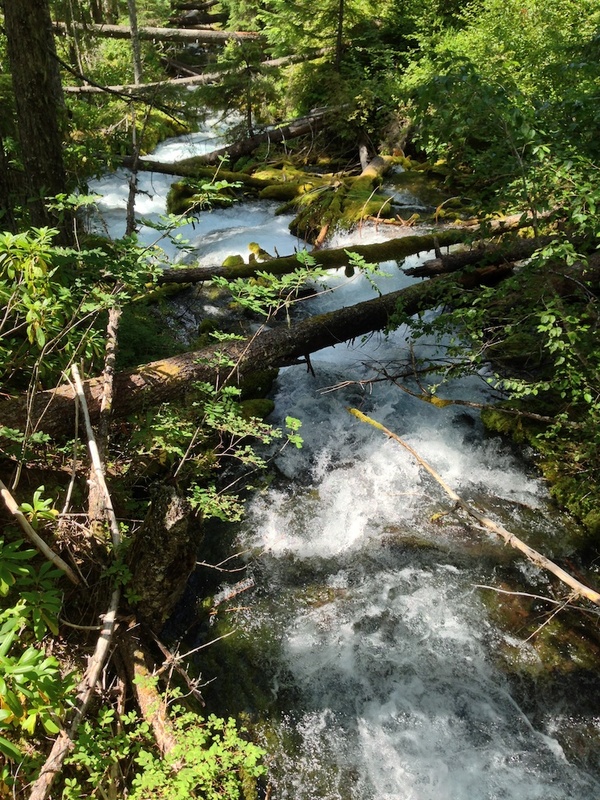 We drove up for a mile or two and found all of the tributaries dry–which meant there must be a spring between where we were on the road and where we used to be. Excited, we followed an abandoned logging road which parallels the stream. Where this road ended, we ‘swacked back to the stream and instead of finding a stream, we found a small creek. We concluded the the spring must lie between us and where we used to be, so we bushwacked some more and followed the creek down for maybe 1000 feet. There, close to and below our previous vantage point, we found a large spring. A spring that generated twice the water of the creek, but flowed directly into the creek with no waterfall. There wasn’t really even a good photo that could be taken of it. Pretty much the only way one could tell there was a spring there was to notice that above a certain location the creek was small, and below that location, the creek was much larger. But far from 1% the flow of the Willamette River. The consolation prize was the privilege of filling up my water bottle from the spring, water that had been filtered through miles of pumice, and tasted more refreshing and pure than any other backcountry water I had ever tasted. The next day, we climbed South Sister, which was beautiful, crowded, and uneventful. I even got to fly a kite from its summit. This entry was posted in Hike by mastica. Bookmark the permalink.